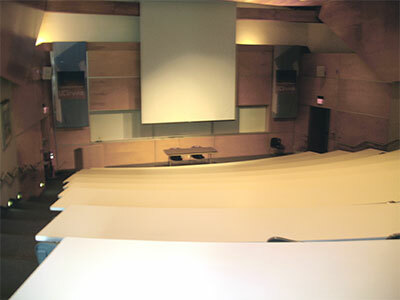 McDonnell Douglas Engineering Auditorium (MDEA). This is a large seminar room that seats 100. It has seminar tables with a power outlet at every seat! The presentation technology is basic, just a podium with a VGA+audio cable and a (wired) microphone, so bring your own laptop and VGA adapter (or borrow one) if you're presenting in this room.